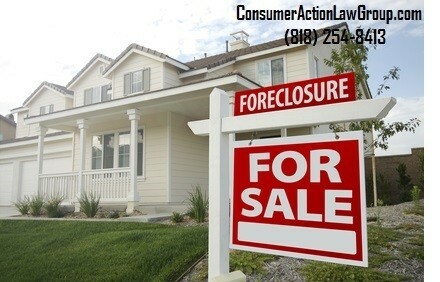 Consumer Action Law Group has a team of attorneys dedicated to stopping foreclosure sales. The foreclosure attorneys at the firm offer free legal advice to homeowners in California seeking legal help to stop foreclosure auctions. July 1, 2015 – Los Angeles, CA — The best way to learn how to stop a foreclosure auction in California is to talk to a foreclosure attorney. The legalities involved in foreclosure and the different options that homeowners have in preventing a foreclosure or stopping a foreclosure auction are usually not simple matters. Those in need of help fighting foreclosure need to make sure that their home and their rights are protected. Most lenders are not interested in helping borrowers that cannot make home loan payments. A notice of trustee sale only provides 20 days to either pay all the money owed to remain in the home or lose the home in a public auction. Twenty days is still enough time to make arrangement to avoid losing the home when an experienced foreclosure attorney gets involved. There are several methods that borrowers can use to stop a notice of trustee sale and the foreclosure process. These methods include litigation, bankruptcy, modification, short sale, and deed in lieu. A loan modification is a voluntary change of the loan terms by the lender. A short sale is an agreement that the lender approves to sell the home for less than what is owed. A deed in lieu means homeowner transfers all their interest in their home to the lender. A deed in lieu of foreclosure carries the risk that you will end up owing any loss to the lender. Lawyers use 2 methods of avoiding foreclosure: filing a lawsuit or filing bankruptcy. In order to avoid a foreclosure auction, it is best to hire an experienced foreclosure attorney. The foreclosure attorneys at Consumer Action Law Group stop foreclosure through litigation and bankruptcy. A lawsuit filed in court by a foreclosure attorney usually stops the lender from moving forward with the foreclosure process until the case is settled. In most cases, once a case is filed, borrowers remain in their home until a decision is made in the lawsuit. Many lenders have used illegal tactics in pursuing foreclosure against borrowers. A lawsuit and an investigation by an experienced foreclosure attorney can bring to light illegal practices that are strictly forbidden under California Law. If a homeowner is facing foreclosure, they may be able to keep their home by filing a lawsuit, even if they have exhausted their options with the lender. Bankruptcy is another strategy for stopping foreclosure. Experienced foreclosure attorneys will advise that bankruptcy is a very effective tool for immediately stopping any sale or any collections [including repossessions of vehicles]. There are different chapters of legal bankruptcy that can stop foreclosure and a foreclosure attorney can help homeowner file bankruptcy to keep their home. There is no need to face a foreclosure alone. The foreclosure process and the laws involved are complex. The best choice is to find an experienced foreclosure attorney that has a verifiable and documented record of success; a foreclosure lawyer that knows how to stop a foreclosure auction in California. The foreclosure lawyers at Consumer Action Law Group are dedicated to stopping foreclosure and helping homeowners stay in their homes. Their foreclosure attorneys take the time to explain the best foreclosure options over the phone; Consumer Action Law Group offers free legal advice to anyone facing foreclosure. The first call is always free, and it could stop the foreclosure sale. Consumer Action Law Group is a law firm dedicated to help consumers in consumer-related matters or consumers that experienced fraud and scam. Attorneys in the team are knowledgeable and experienced in the areas of eliminating debt, mortgages fraud, auto fraud, and foreclosures. They have direct experience in consumer fraud matters and helping consumers who are facing financial crisis, foreclosure, issues with employers, and problems with auto dealers.